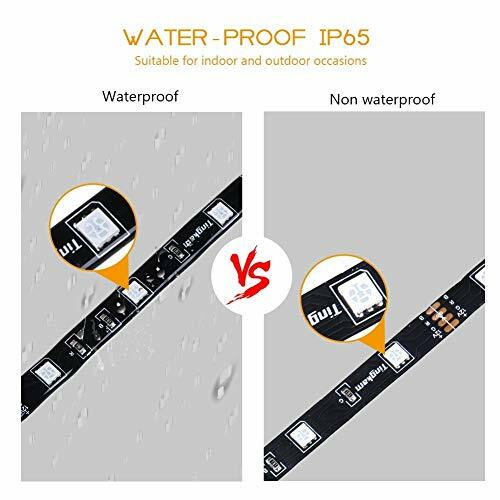 Tingkam Waterproof 5050 SMD 32.8ft (10m) RGB LED Strip Light Kit, Color Changing Black PCB Rope Lights+44-key IR Controller+ Power Supply for Home,Kitchen,Trucks,Sitting Room and Bedroom Decoration. 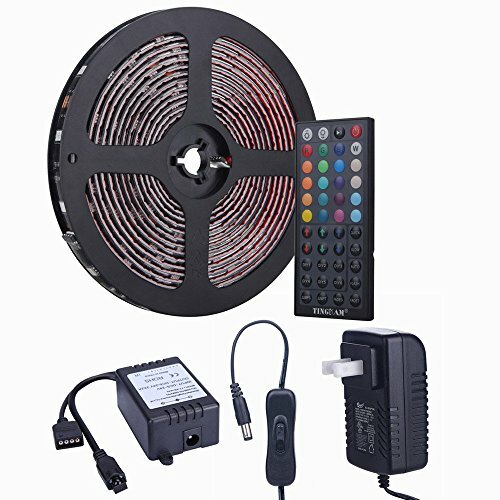 ã€All in one kitã€'This package comes with a reel of 32.8ft waterproof (IP 44) RGB led strip, a black remote controller with sensor and a power supply. All you need are covered.Note: The "W" key on the controller is not pure white which seems a little blue. ã€Our Advantagesã€'We offer the black background color of the strip which blends in better with darker color furniture than the white color strip.Also,Double layer copper, double costs than other single layer copper LED strips in the market. 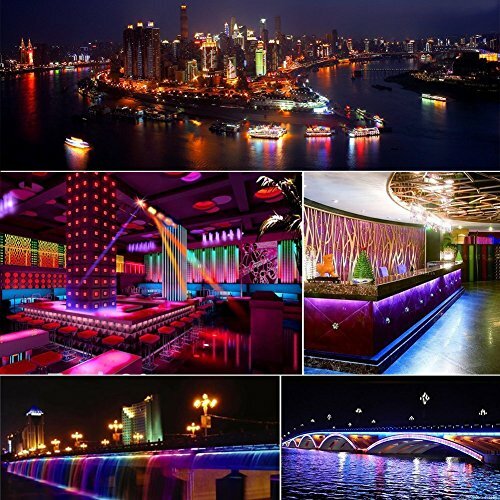 ã€Several Applicationsã€'The RGB LED strip lights can be used for decorating your home (e.g. dining room, bed room, upstairs,home, kitchen,patio, porch and living rooms). Great for holidays and events like Christmas, Halloween and Birthday Parties! ã€Cuttable and linkableã€'Our 10m rope lights can be cut every 3 LEDs along the cutting marks without damaging the rest of the strip. Improved 3M adhesive on the back fits many dry and flat surfaces. ã€18 months warrantyã€' Every item you ordered from Tingkam can enjoy a replacement or full refund within 18 months. Don't hesitate to contact us for help when you have any issues about our products. Our friendly 24/7 customer support will put you at ease. 2. Compared to the traditional lighting, the led lighting is lower power consumption, more energy saving and environmental protection. 3. The flexible strip bands can be curved or bent, so you can use them for decoration in many occasions. 4. You can cut the strip every 3 leds along the line in between the gold bands or scissors marks on the strip. 5. 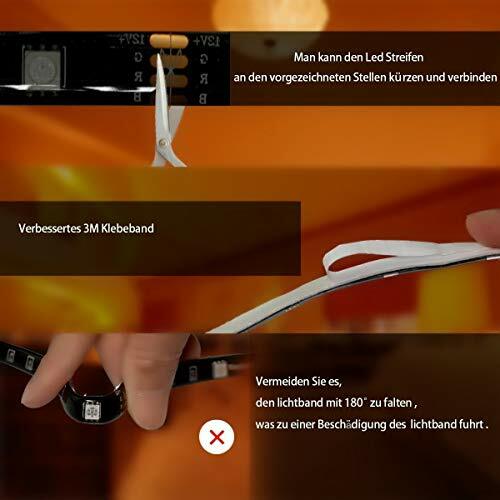 Plug and play, easy installation with the adhesive tape on the back to paste. 6. 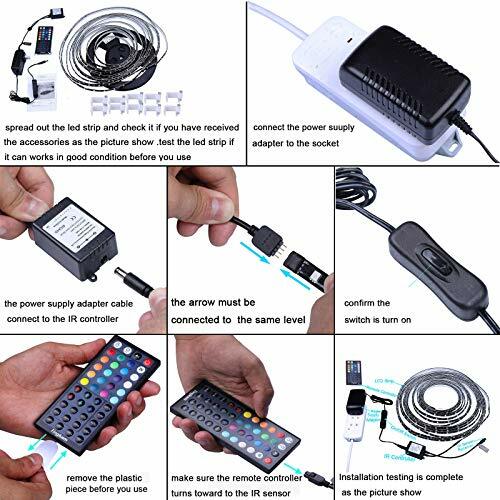 The led strip full kit comes with all black essential parts, which will provide you a new lighting vision that is different from the white ones. 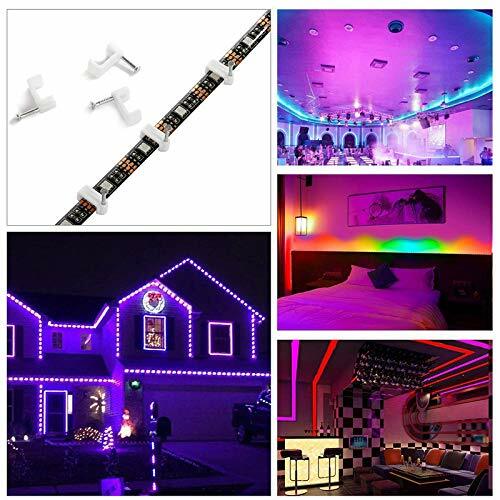 It is widely used as decorative lights for holidays and events, i.e exhibitions, weddings, birthday parties, school parties, dancing parties, Christmas, Thanksgiving Day, Saint Valentine Day, Halloween, etc. 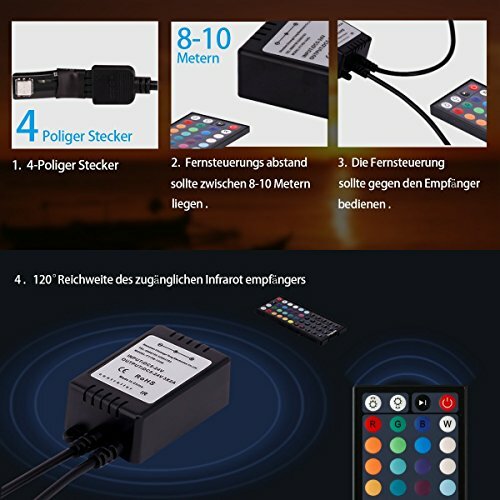 It's a good choice to use the lights for hotels, restaurants, night clubs, coffee/ wine bars, shopping malls, cinemas, beauty centers, office fronts, even lights for household kitchens or living rooms, etc. All products brought to you by Tingkam are manufactured to the highest standards of performance and safety, and, as part of our philosophy of customer service and satisfaction, are backed by our comprehensive 12 Month warranty.